Did you use the assemlby2 workbench for this? Indeed, the robot looks really cool! Currently, I'm working on a similar one. It's a six legged robot with a RaspberryPI as its main brain box. I developed a multi channel servo controller based on a cheap ST ARM micro controller board. It's the "famous" blue pill and it supports up to 24 parallel PWM channels with timed signal interpolation (more are possible depending on the number of pins your micro has). I also wrote a control/simulation software for testing the kinematics of the robot. I don't have a FreeCAD model right now, just some pieces of PVC hard foam sheets for the chassis prototype but this should be enough for some basic tests. BTW: It seems that this robot uses little dc motors with gear boxes to move each leg. I don't know how he determines the actual joint positions of the robot, but this is essential for a working kinematic system. With servos this is quite simple. Indeed, there is a place for encorder rings and refractory optocuplers to use for that matter. But haven't got the time to work on the electronics for it. My idea was to use an FPGA+hard processor for the control. 0666: read and write access for all! 1st Post! Brand new to FreeCAD and this is my first model. I Just finished it today. Welcome here with a by far not trivial first model. Thank you! It took me forever to figure out that I can do everything in part design- I originally was trying to use both part and part design and the errors were driving me crazy! 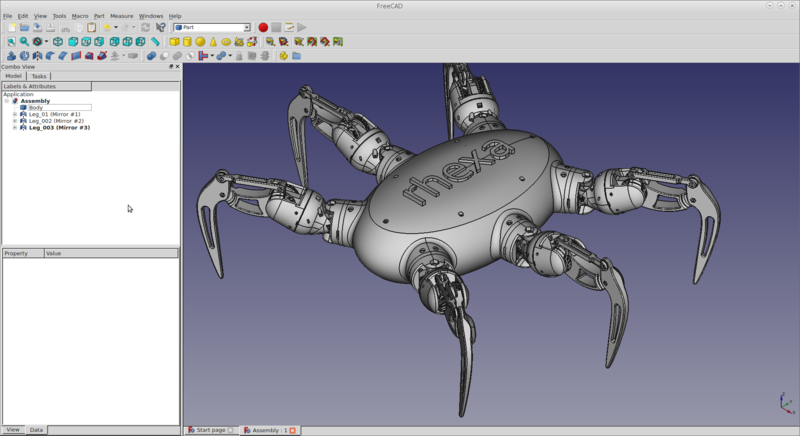 I come from SolidWorks and I'm so impressed at how a free software is so powerful. Amazing. Would you care to make a tutorial on this? Especially your perspective coming from Solidworks and how you adjusted to FreeCAD ? We need more documentation of this kind.